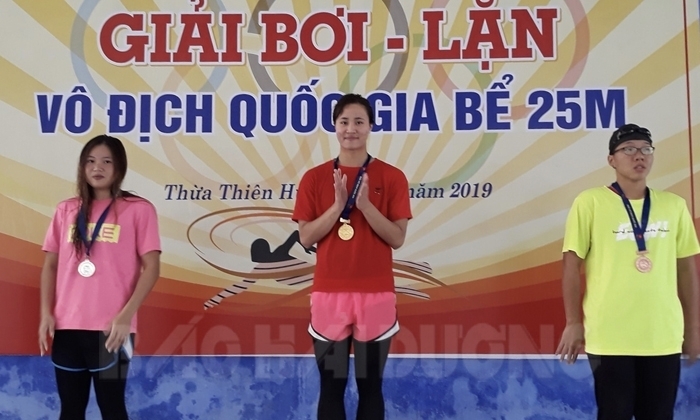 The 2019 National 25m-pool Swimming and Diving Championship kicked off in Thua Thien - Hue on March 20. On the first day of competition, Hai Duong diving team won two golds and one bronze, exceeding the assigned target. All of the three medals were snatched by diver Pham Thi Thu. Notably, Thu grabbed the two gold medals after having broken national records. Specifically, it took her 21.53secs and 48.83secs to come first in 50m and 200m bifin events, surpassing the old records of 22.24secs and 49.63secs, respectively. The 2019 National 25m-pool Swimming and Diving Championship attracted 16 teams from provinces, cities, and the army. With seven members, Hai Duong diving team is competing in 12 out of 26 events. The tournament is to end on March 22.